This blog is to keep my friends updated with my continuing conversion of a Porsche 914 to an electric vehicle. I hit the 1,000 mile mark today. I have been driving the EV for a little over a month now and so far I'm mostly happy. The only real issue I've had is that one of the batteries is failing already. I suspect it was bad all along but I did not know it. As soon as I put the car in service I was having occasional charging failures where the charge timed out before completing it's cycle. After I installed the PakTrakr I found which battery was causing the trouble. When fully charged it looked okay as far as voltage but it very quickly lost power during use. I could see that during acceleration it was typically 2 volts or more below all of the others. I have taken it out and sent it back to the supplier for evaluation and/or replacement. In the mean time I took a chance and bought a similar battery at Sam's, for about half the price, and installed it. It did not have the L terminals so I had to get a little creative but it works. I have noticed that the voltage sag is not as great under load so I think this might improve the range a little. Time will tell. Today I made a modification to the regenerative breaking switch to allow me to either have it on when slowing down, as the original kit does, or to have it on when the brakes are applied. I will evaluate this and see if I like it. The compressor for the air conditioning has been ordered and I am expecting it in about a month. I ordered a Masterflux compressor that runs off of the pack voltage. When that comes in and gets installed I'll post the results. I drove the car to this month's meeting of the Houston Electric Vehicle Association meeting and it was well received. I was very surprised by the intense interest some members showed in it and I was also surprised that a couple of others were contemplating the same conversion. That would be great. I'll continue testing and post anything new as it happens. I have not updated the blog in the last few days because I have been working so hard on the car. I got the batteries put in the boxes and the connections made. I finished that yesterday. Here is the front box. I did not take a picture of the center box but you can see it at the top of this picture. After getting all of the connections made I turned the key on and it worked. I took it around the block a couple of times and noticed that it was kind of sluggish. But at least it ran. I did notice that when the pack voltage drops on acceleration the 12 volt accessory voltage rose to 129 or more. I will need to check this further. Well here's an update. I got the hoods put back on and the covers for the battery boxes installed today then I drove the car about 40 miles and the DC-DC converter failed during the trip. I'm not too surprised since several others have had problems with this unit. I will be ordering a replacement later on tonight. I have finally gotten back to work on the car and completed the installation of the rear battery box. After reading Ross's blog about acid leakage from the rear battery box I became concerned. After I initially followed the kit instructions and used silicone sealant on the seams I had to remove the box because it did not fit right. I found that the sealant did not adhere very well to the box seams. It peeled right off when I pulled it apart so I started investigating alternatives. I have decided to weld the seams. I'll show a picture when I try it. I also got the front trunk area completed. The charger is installed backwards of the instructions because the wire that connects it to the batteries won't reach the passenger side. I, like most everyone else, don't like the idea of the box venting fans running on power supplied by the accessory battery so I get a 12VDC power supply from Fry's to power them and to light the status lights on the dash. Here is the power supply. Here is the AC power connection. on the passenger side. If I had followed the instructions for the AC power plug installation I would have put it on the fender but I did not want to drill into that beautiful body so I put it on the front bumper. I ordered a spring loaded license plate bracket and it will install over the plug so it is not normally visible. And here is the dash with new speedometer, tachometer, and status lights installed. The old gauges would not fit this new dash plate so I put in AutoMeter gauges. I can actually see these gauges at night unlike the original ones. The tachometer is calibrated with the DMOC but the speedometer will have to wait until I can actually drive the car for calibration. Finally, here is the installation of the blower box for the air conditioning. I did this some time ago but did not show any pictures of it. Up next are a few odds and ends and then I'll be ready to install the batteries. After a long "vacation" I'm back working on the car again trying to make the final push to finish it. I have been to Rome for a while since I last worked on it and I have been making repairs to the house. 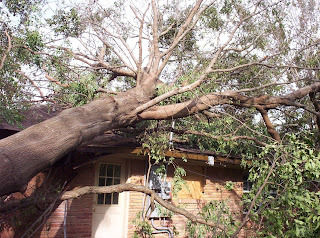 I was lucky that the insurance company was not stingy with their settlement so at the beginning of November, after returning from Rome, I started getting contractors lined up for the repairs. It has been very frustrating but finally they are almost done. All that remains is for the fence to be finished. Now that I am back with the car I have noticed a curious issue. Back in October I bought a 33AH battery for the accessory battery. It seemed to be okay at the time but sitting for 2 months with the wiring connected it drained down to 2 volts and now I can't get it to accept a charge. It may be a bad one but I hope not since the warranty was only 30 days. I'll see if I can coax a charge in it today and I am also working on the gauges and lights so I'll try to get some pictures of that. Well it looks like the business trip that I thought was going to be short was a little more than that. I was in Algeria for a little more than a week and then went right to China for several weeks. 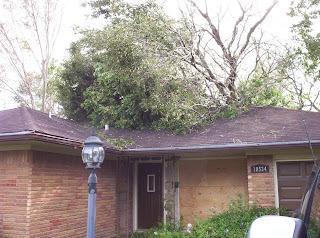 While I was gone, Hurricane Ike struck here in Houston. 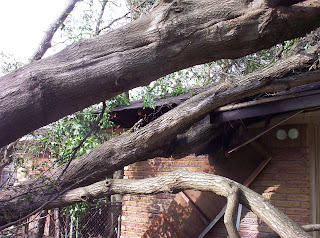 Two trees fell on my house and caused a lot of damage. 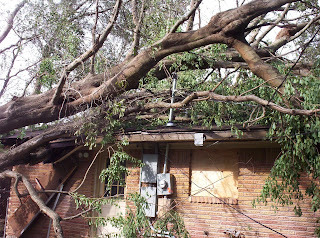 Here are a few pictures of the damage. 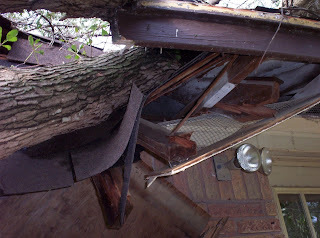 After getting the trees removed there were 5 holes in the roof along with the crushed part shown above. Now I have the joy of dealing with the insurance company and repairs. While waiting for that I started working on the car some more. Before I left I had just received the air conditioning parts. I got them from a company called European Cooler Air in Rockwall, Texas. This is a great company to work with. Since the only real place to mount the condenser is the front trunk and there is limited room now that a battery rack is going there I talked with Jerry West at European Cooler Air and told him that I had only about 2 1/2 inches under the rack and asked him if it could work. He said that he could make it fit. The solution was to put the condenser below the trunk and mount only the fan and drier in the trunk. After a lot of cutting and fitting here is the result. The receiver/drier is the long black tube on the left. I had to grind a little of the angle iron on the rack to make it fit but it does. I also had to modify the rear mounting of the rack to accommodate the large round hole. It's all bolted in and the hose connectors are tightened up. It looks like it will work. Here is a picture of the underside showing the housing around the condenser installed. It's not a very good picture because everything is black but hopefully you get the idea. I also worked on the front relay and battery rack wiring as you can see here. The relays are ready to go along with the DC / DC converter. After a little caulking around the fan in the front trunk I will put this in an finish the front wiring. Up next is the installation of the blower housing in the passenger compartment.